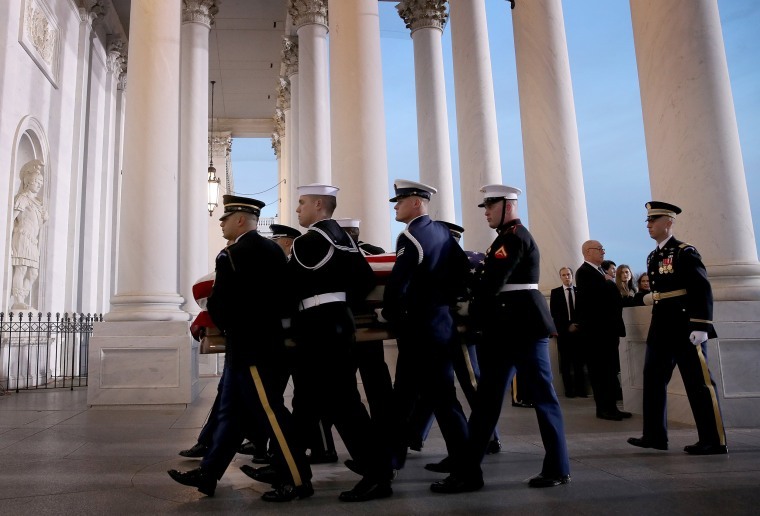 The flag-draped casket of the 41st president was transported to the Capitol rotunda, where it will lie in state for the public to view until Wednesday. 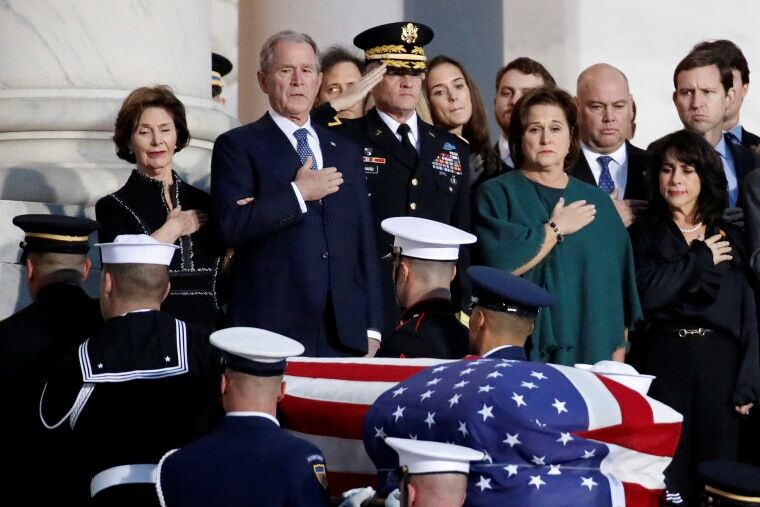 Former President George W. Bush and former first lady Laura Bush visit the casket containing the body of former President George H.W. Bush in the Rotunda of the U.S. Capitol on Dec. 4, 2018. 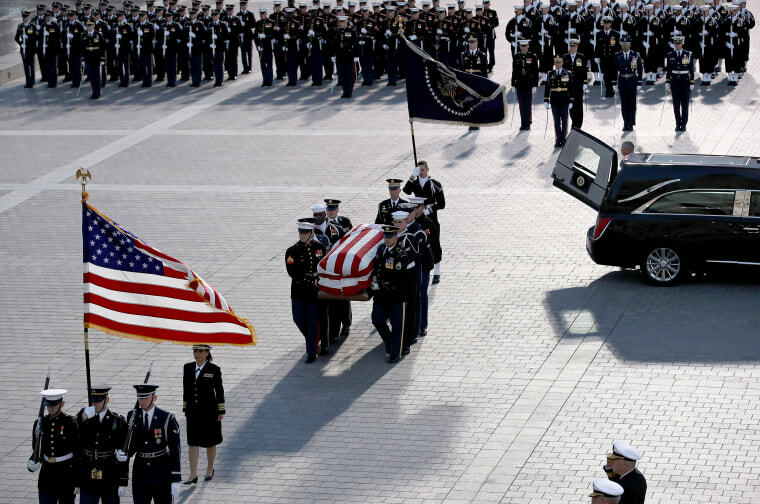 Members of the public pay their respects to the former president. 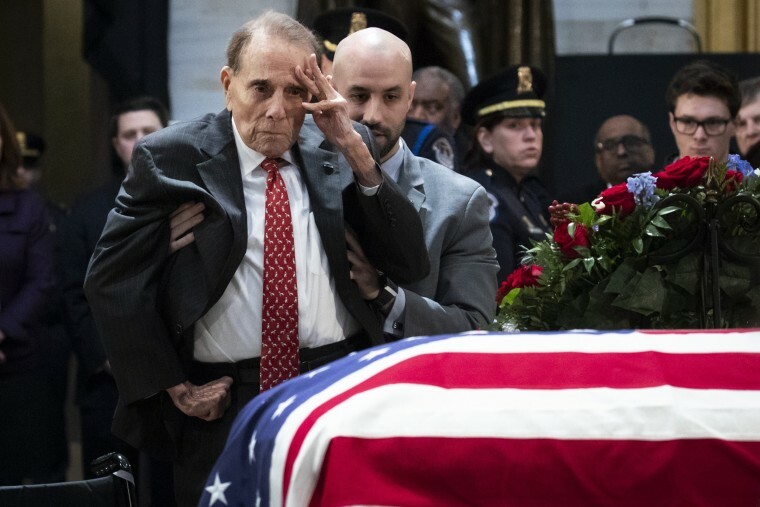 Former Sen. Bob Dole salutes the casket of the late president at the Capitol on Dec. 4. 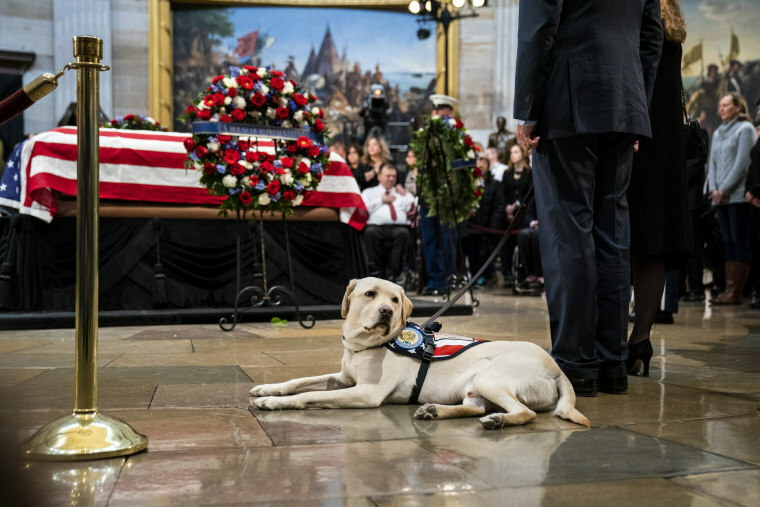 Sully, the service dog of the former president, sits near the casket of the former president as he lies in state at the Capitol on Dec. 4. The yellow labrador joined the Bush family to help in June, weeks after the death of former first lady Barbara Bush. Former first lady Laura Bush and former President George W. Bush greet first lady Melania Trump and President Donald Trump outside of Blair House in Washington on Dec. 4. Trump paid a condolence call to the Bush family at Blair House, the government guest house across the street from the White House where the Bush family is staying. Stephen G. Leighton Jr. salutes while paying respects with his father Stephen G. Leighton Sr. at the Capitol on Dec. 3. 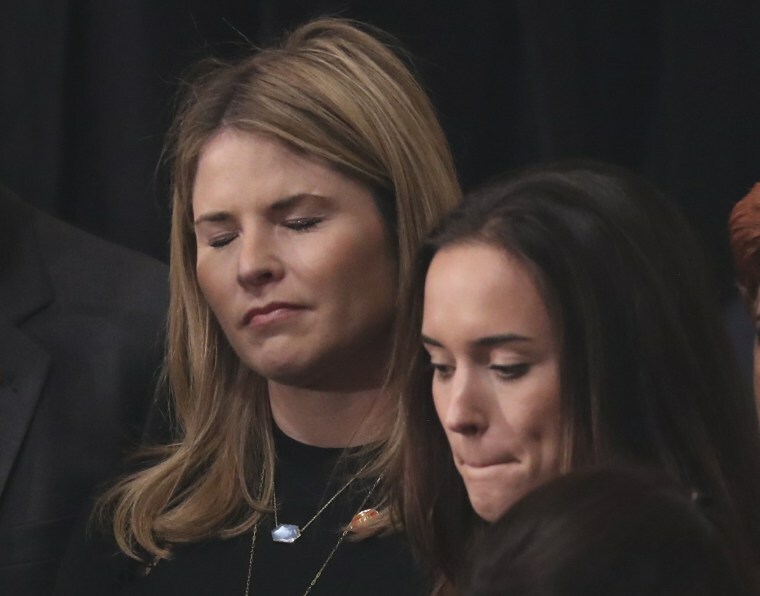 Jenna Bush Hager, left, the late president's granddaughter, stands with mourners in the Capitol Rotunda on Dec. 3. 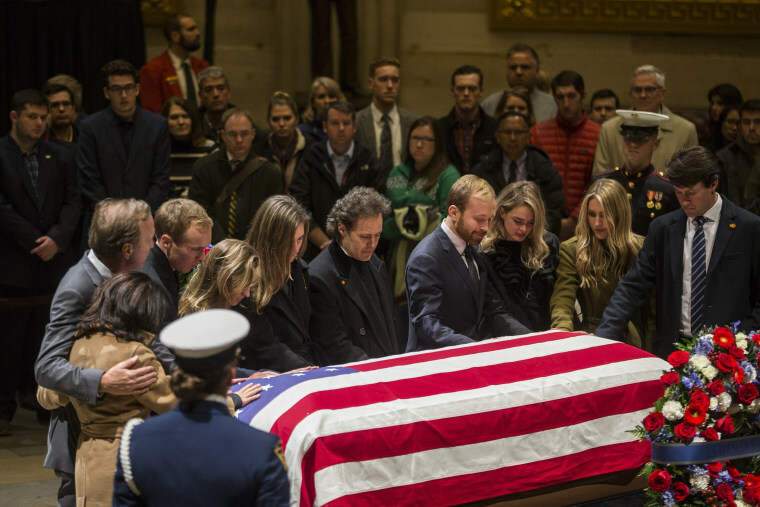 Neil Bush, left, one of the late president's sons, and his family touch the casket. From left, Vice President Mike Pence, former President George W. Bush, former first lady Laura Bush and former Florida Gov. 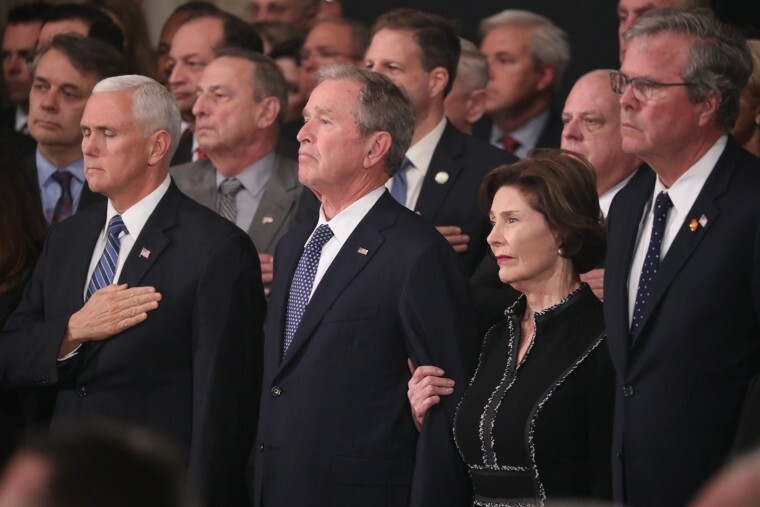 Jeb Bush watch as the casket arrives on Dec. 3. Members of the military stand guard as people pay their respects. 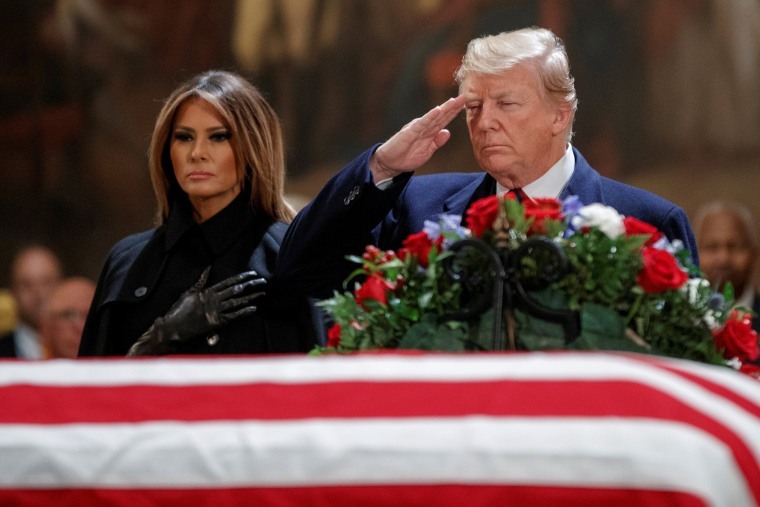 President Donald Trump, with first lady Melania Trump, salutes the casket. 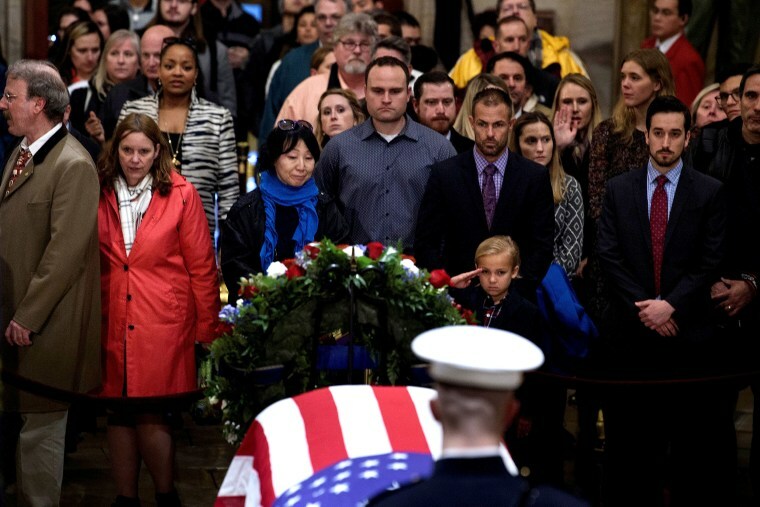 Former President George W. Bush and other family members watch as the flag-draped casket of his father is carried by a joint services military honor guard to lie in state in the rotunda of the U.S. Capitol on Dec. 3. The casket is carried up the steps of the Capitol. 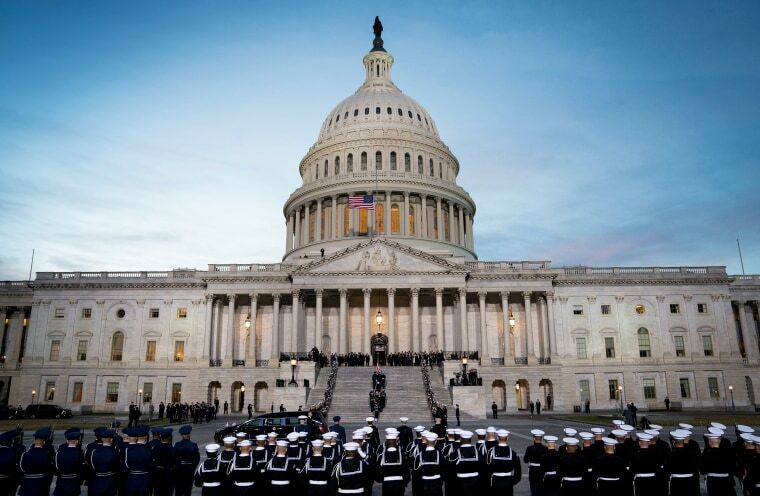 A public service will be held Wednesday at Washington's National Cathedral. A military honor guard team carries the casket into the Capitol. Tributes to former U.S. President George H.W. 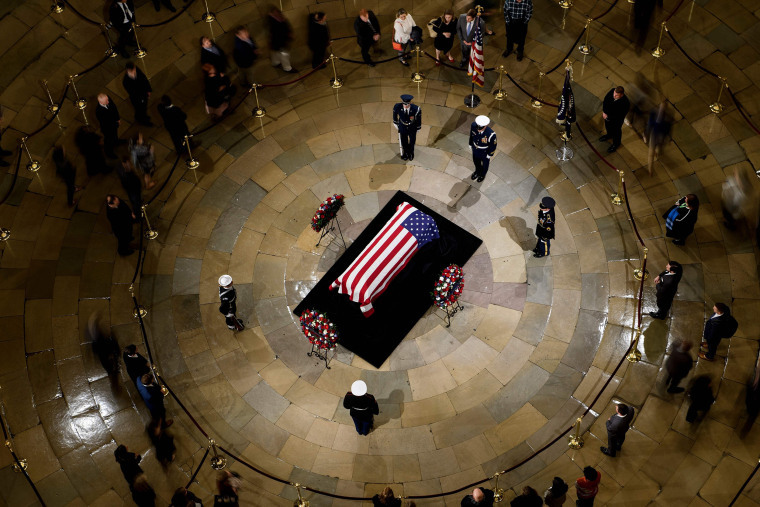 Bush at the U.S. Capitol, as the casket of President Bush arrives under an honor guard on Dec., 3, 2018. Sailors from the USS George H.W. 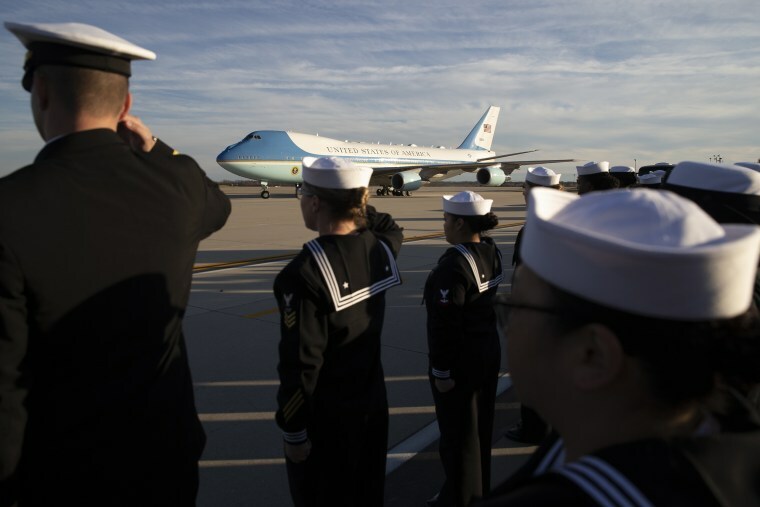 Bush (CVN 77) salute as the plane carrying the flag-draped casket of the former president arrives at Andrews Air Force Base on Dec. 3. 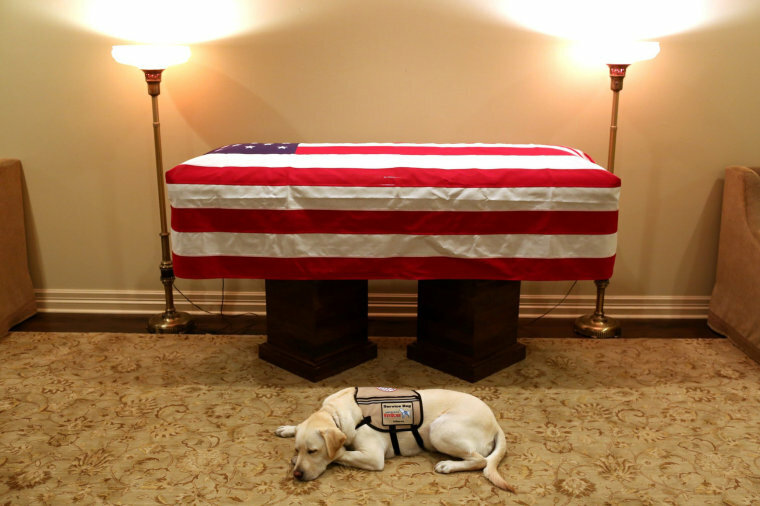 Sully lays in front of Bush's casket at a funeral home in Houston on Dec. 3. 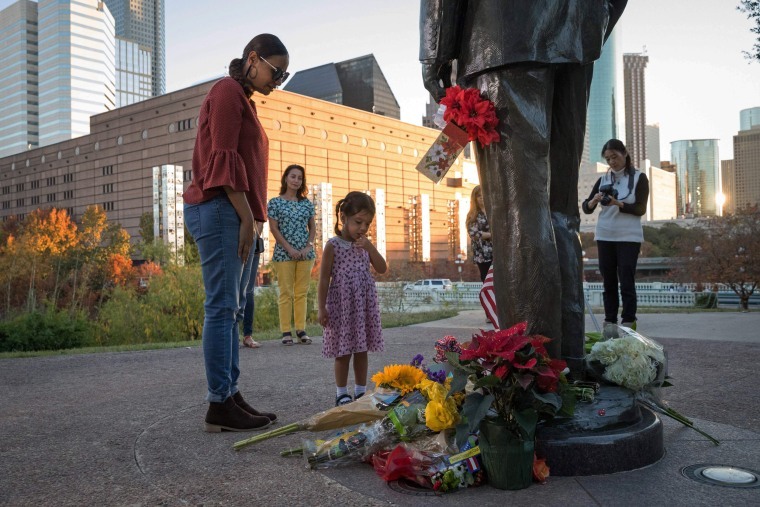 Mourners pay their respects at a statue of President George H.W. Bush in Houston on Dec. 2. 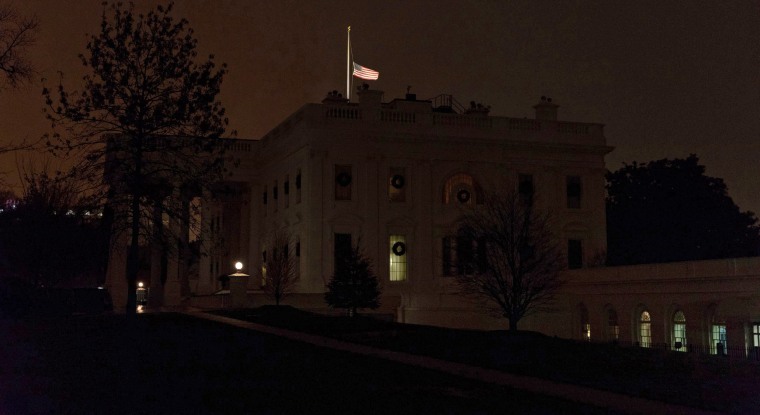 The flag flies at half-staff at the White House in tribute to former President George H.W. Bush early on Dec. 2, 2018.